My wife Leslie and I have been gaming together for about two and a half years. We don't have a huge collection compared to a lot of BGG users (around 55 games, not counting expansions) but we have a lot of games that we haven't played nearly enough. SO, we have a plan: each month we'll choose an offer of around eight games and those are the only games that we play together for the whole month. I mean, we cheated of course! We played Lords of Waterdeep: Scoundrels of Skullport and Mascarade at our friends' office's game night, later we played Dungeon Petz, Tsuro, and Last Will with some pals, and last weekend my wife and me played five games of Love Letter together while stuck in the Atlanta airport. ... the more I think about it we cheated on our list a LOT ... but the intention is still there! We'll see how the experiment goes over the next couple of months with Secret Santa and Christmas dropping new games on our table, but I think this is something that we want to stick with. I totally recommend the system to any couples looking to chew through their collection a little! Claustrophobia! One of three games in this month's offer that've carried over from last month. We love this one. With the expansion to this in stores and our nearly unplayed copy of Descent: Journeys in the Dark (Second Edition) on our shelf, my wife and me really want to finish this base game! Playing it all together feels like we're going through a whole tv series on Netflix. Commands & Colors: Ancients! Man, I think we must have owned this game for eight months and have played it maybe three times. Leslie and me are both super excited to really learn it and chew through the scenarios, committing to learning the strategies of the ancient world. De Vulgari Eloquentia! We got this over a month ago and have yet to play it! I know very little about this game but Leslie is JAZZED about it. I've heard there are some good variants to help this along for two players. I'm excited for this game even if I don't know the shape of it yet! I'm excited for my wife's excitement! 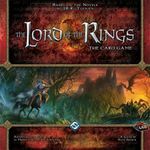 The Lord of the Rings: The Card Game! One of our favorite games but unfortunately it's has been on the back burner for several months. We have our lovingly built decks (Leslie with her Spirit and Leadership, me with my Tactics and Will), we've travelled all over Middle Earth, we've slain creeps, we've had a really a wonderful time ... and then we got stuck on a stubborn scenario in the Khazad-dûm expansion. This month we're finally going to bust through Moria and see what's on the other side. Probably more creeps. 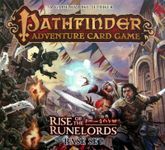 The Pathfinder Adventure Card Game! The second game on our offer to carry over from last month. This is here in preparation for the newly released Skinsaw Murders Adventure Deck. I like this game a lot more than my wife does and I'm very grateful for her playing this with me ... for the next year or so. 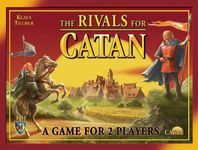 The Rivals for Catan! The lightest game on the offer. Leslie got me this for my birthday back in May and I think that we've only played it twice. It's very sweet looking, it seems relaxing, and I'm looking forward to paying attention to it this month. Through the Ages! A big one! I gave Leslie this for her birthday over a year ago and we've only played through the first introductory game. We KNOW that we're going to love this. Leslie is bananas for any kind of civ builder, and it's so highly regarded on BGG, but it's been very intimidating. I think out of everything on the offer this month this is the one I am simultaneously the most scared of and the most excited about learning. Twilight Struggle! The third game on our offer to carry over from last month. We bought Twilight Struggle early last month. It was kind of a risk because in the past we both had a terrible time playing 1960: The Making of the President, but the Cold War theme is more interesting to us and we figured it'd be hard to go wrong with BGG's consistent number one game. Leslie and me really like this so far. We're still stumbling around the board but we recognize the value of playing this game over and over again. I'm counting on us gaining a greater understanding of Twilight Struggle in November!